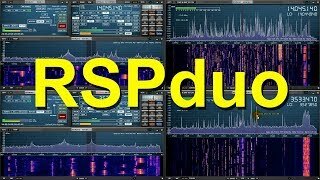 RSPduo is a new SDR receiver from SDRplay. 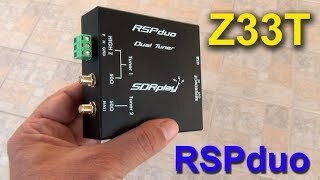 The RSPduo is a dual-tuner wideband 14-bit SDR receiver which covers the entire RF spectrum from 1kHz to 2GHz giving up to 10MHz of spectrum visibility. Combined with the SDRuno software, this SRD receiver with its two totally independent tuners, can simultaneously receiving, monitoring and recording two separate 2MHz bands of spectrum, anywhere between 1kHz and 2GHz. In single tuner mode, RSPduo can receive, monitor and record up to 10 MHz of spectrum at a time. The RSPduo provides three software selectable antenna inputs. All it needs is a PC and an antenna to provide excellent communications receiver functionality. The RSPduo Covers all frequencies from 1kHz through VLF, LF, MW, HF, VHF, UHF and L-band, up to 2GHz, with no gaps. This is excellent RSGB video "Amateur radio - a 21st Century hobby"
I have just translated it to Macedonian language. 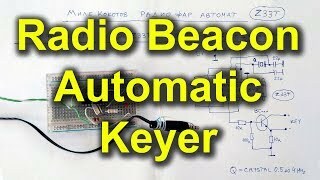 This is Programmable Automatic Radio Beacon Keyer with PIC16F84 microcontroller. 00:18 to 00:48 = RSP1A receiving Very strong signal of Local Radio Station on 106.4 MHz, with 192 kHz WFM Filter. 00:48 to 01:24 = Airspy HF+ receiving Very strong signal of Local Radio Station on 106.4 MHz, with 192 kHz WFM Filter. 01:24 to 02:01 = RSP1A receiving Very strong signal of Local Radio Station on 107.6 MHz, with 192 kHz WFM Filter. 02:01 to 02:38 = Airspy HF+ receiving Very strong signal of Local Radio Station on 107.6 MHz, with 196 kHz WFM Filter. 02:38 to 02:59 = RSP1A receiving Very strong signal of Local Radio Station on 107.6 MHz, with 192 kHz WFM Filter. 02:59 to 03:21 = Airspy HF+ receiving Very strong signal of Local Radio Station on 107.6 MHz, with 196 kHz WFM Filter. 03:21 to 03:42 = RSP1A receiving Weak signal of Radio Club FM from Skopje on 103.4 MHz, with 120 kHz WFM Filter, no Noise Reduction. 03:42 to 03:54 = RSP1A receiving Weak signal of Radio Club FM from Skopje on 103.4 MHz, with 120 kHz WFM Filter, Noise Reduction is switched ON. 03:54 to 04:16 = Airspy HF+ receiving Weak signal of Radio Club FM from Skopje on 103.4 MHz, with 120 kHz WFM Filter, no Noise Reduction. 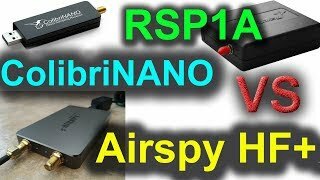 04:16 to 04:31 = Airspy HF+ receiving Weak signal of Radio Club FM from Skopje on 103.4 MHz, with 120 kHz WFM Filter, Noise Reduction is switched ON. 04:31 to 05:02 = Airspy HF+ receiving Very weak signal of Radio BUM from Kumanovo on 104.2 MHz, with 96 kHz WFM Filter. 05:02 to 05:29 = RSP1A receiving Very weak signal of Radio BUM from Kumanovo on 104.2 MHz, with 120 kHz WFM Filter. 05:29 to 06:04 = RSP1A receiving Very weak signal of Radio Metropolis from transmitter in Tetovo on 104.3 MHz, with 120 kHz WFM Filter. 06:04 to 06:36 = Airspy HF+ receiving Very weak signal of Radio Metropolis from transmitter in Tetovo on 104.3 MHz, with 120 kHz WFM Filter. 06:36 to 06:59 = Airspy HF+ receiving Very weak signal of Radio ZONA M1 from transmitter in Skopje on 104.4 MHz, with 120 kHz WFM Filter. 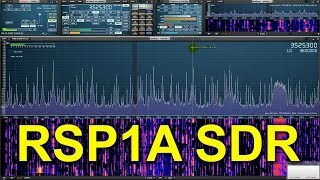 06:59 to 07:25 = RSP1A receiving Very weak signal of Radio ZONA M1 from transmitter in Skopje on 104.4 MHz, with 120 kHz WFM Filter. 07:25 to 07:47 = RSP1A receiving weak signal of Radio Bubamara from transmitter in Skopje on 105.2 MHz, with 192 kHz WFM Filter. 07:47 to 08:16 = Airspy HF+ receiving weak signal of Radio Bubamara from transmitter in Skopje on 105.2 MHz, with 192 kHz WFM Filter. 08:16 to 08:48 = Airspy HF+ receiving weak signal of Radio Kanal-77 from transmitter in Coco Peak, near Kladnik village, on 105.5 MHz, with 192 kHz WFM Filter. 08:48 to 09:16 = RSP1A receiving weak signal of Radio Kanal-77 from transmitter in Coco Peak, near Kladnik village, on 105.5 MHz, with 192 kHz WFM Filter. 09:16 to 09:36 = Airspy HF+ receiving weak signal of Radio Antenna-5 from distant transmitter on 106.9 MHz, with 120 kHz WFM Filter. 09:36 to 09:55 = RSP1A receiving weak signal of Radio Antenna-5 from distant transmitter on 106.9 MHz, with 120 kHz WFM Filter. 09:55 to 10:26 = RSP1A receiving weak signal of Radio 5-FM from Veles on 107.1 MHz, with 120 kHz WFM Filter. 10:26 to 10:56 = Airspy HF+ receiving weak signal of Radio 5-FM from Veles on 107.1 MHz, with 120 kHz WFM Filter. 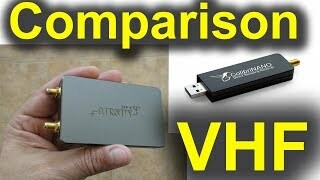 In this video I am comparing three SDR-Receivers. I have made few recordings with every receiver with the same antenna and choose the best one (one with the best SNR = signal-to-noise ratio). My intention was to ensure the same conditions for all three SDR`s in order to make as fair as possible comparison. For example, I was set the frequency span displayed on the window to be as same as possible for all three receivers. The vertical axis for the signal stregth, was set to be equal (in decibels) too.Airspy HF+ and ColibriNANO was set to their minimum sample rate (48 kHz). RSP1A was set to minimum sample rate (2 MHz and 8 decimation). 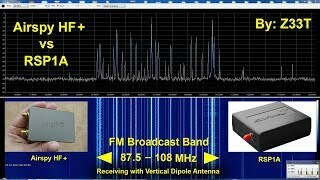 In the first part of the video, The signal from antenna is connected directly to antenna input of the receivers. 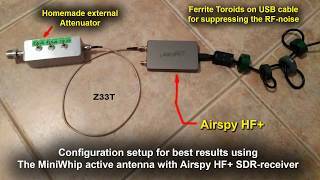 At the second part of the video, the -32 dB external attenuator is connected between the antenna and SDR input. 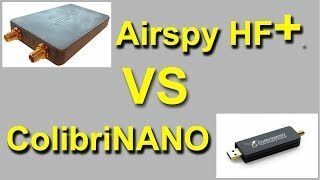 Both SDR-receivers are very good! CQ World Wide DX Contest (CW) receiving in Macedonia with SDRplay RSP1A SDR-receiver and SDRuno software on 80m-Band with full-size half-wave resonant dipole antenna.